The faithful of the Antiochian Archdiocese offer prayers and condolences on the passing of Metropolitan Nicholas of the American Carpatho-Russian Orthodox Diocese of the U.S.A. May his memory be eternal! Johnstown, PA – His Eminence, Metropolitan Nicholas (Smisko), primate of the American Carpatho-Russian Orthodox Diocese of the U.S.A. (Ecumenical Patriarchate of Constantinople) reposed in the Lord today, March 13, 2011 after a courageous battle with cancer. 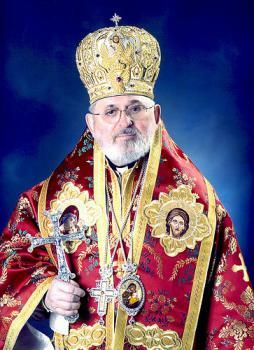 Metropolitan Nicholas was born on February 23, 1936. The son of the late Anna (Totin) and Andrew Smisko, he is a priestly vocation from Saint John the Baptist Church, Perth Amboy, New Jersey. After graduating from Perth Amboy High School, he entered Christ the Saviour Seminary in Johnstown, Pennsylvania to study for the Holy Priesthood. Upon graduation, he was ordained on January 11, 1959 by Bishop Orestes in Perth Amboy, N.J. His first pastorate was at Saints Peter and Paul Church in Windber, Pennsylvania, where he served until 1962. A new phase of his life began when he embarked on a year's study at the renowned Patriarchal Theological Academy at Halki, Constantinople. During his stay in the city, the young priest was assigned by the late Ecumenical Patriarch Athenagoras to serve the spiritual needs of the large Slavic Orthodox community in the Galata section of Istanbul. He also traveled extensively throughout Europe and the Middle East, visiting the sacred sites of the Holy Land and living for a time on Mount Athos, the ancient monastic center of the Orthodox Church. Upon his return to the United States, he resumed his studies at the University of Youngstown, Ohio, and the University of Pittsburgh at Johnstown. He was then assigned as Prefect of Discipline at Christ the Saviour Seminary in Johnstown, and served several parishes in the Johnstown area, before relocating in 1971 to New York City, where he served as pastor of St. Nicholas Church. He was elevated to the rank of Archimandrite in 1976, and was elected by the Holy Synod of the Ecumenical Patriarchate of Constantinople as Auxiliary Bishop for the Ukrainian Orthodox Diocese of America and was consecrated as Bishop on March 13, 1983.
as the third ruling hierarch of the Carpatho-Russian Diocese and was enthroned in Christ the Saviour Cathedral by His Eminence, Archbishop Iakovos on April 19, 1985. He was elevated to the rank of Metropolitan, by His All-Holiness, Ecumenical Patriarch Bartholomew I on November 24, 1997. Over his many years of service to Christ and His Holy Church, His Eminence has proven to be a worthy laborer in the Vineyard of the Lord. In recognition for his labors he was the recipient of the Saints Cyril and Methodius Award, given by the Orthodox Church of Czechoslovakia, the St Sava Award from Patriarch Pavel of the Serbian Orthodox Church and the honorary Doctor of Divinity degree from Holy Cross School of Theology. His Eminence has been noted for his love for his flock and the liturgical services of the Church, and his devotion to the Mother Church, the Ecumenical Patriarchate. He was well-respected in Orthodox and Ecumenical circles as being a promoter of peace and mutual understanding amongst all Christ-loving people. True to his patron Saint, Nicholas the wonderworker, His Eminence was perhaps best known and respected for his pastoral sensitivity, generosity of spirit and compassion for the sick and suffering and the less fortunate. May His Memory Be Eternal. Funeral arrangements will be forthcoming. On OCN Now, Fr. Chris will share a word of condolences on the passing of Metropolitan Nicholas who was one of the Hierarchs who voted for OCN to become an agency of SCOBA and now working within the context of the Assembly of Bishops. Click here to listen.